Location: Olymp Hotel is a sport and family 4-star hotel located in Teteven, just 120 km away from Sofia and 60 km away from Troyan. Accommodation: Olymp Hotel offers 23 standard rooms, 37 deluxe roomes, 9 suites, and 3 duplex suites. Charmingly decorated and comfortably furnished, some of them have an incredible view of the forest and provide all necessary facilities for an invigorating holiday. Wine and dine: The Olymp restaurant serves various healthy, traditional, and European dishes. The hotel also offers a cosy lobby bar, a Viennese Coffee House, a summer bar and a barbecue. 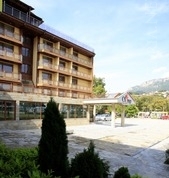 Sports & recreation: Olymp Hotel offers a unique range of sports facilities which fulfill all necessary requirements for a professional football, volleyball, basketball, wrestling, judo, and sambo training. Conference facilities: Olymp Hotel offers a stylish and comfortably furnished conference hall with a capacity of 50 people for corporate events and seminars.